I was looking for something yummy to bring with me for lunch today at work. It had to be high protein and low carb, easily fit in my little lunch bag, keep me full for a while, and still taste really good. I get tired of foods pretty quickly – tuna salad is one of those foods that I can only have for a few days and then I need to move on to something else. 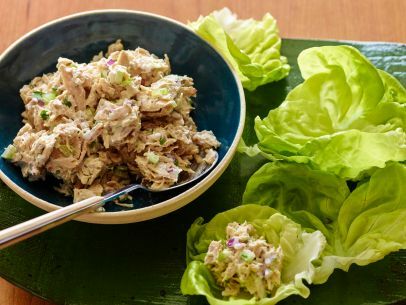 I set out to find a new tuna salad recipe that I could really enjoy rather than mixing some mayo in a bowl with tuna, salt, and pepper – blah. I found a recipe that I thought was pretty darn good. Hope you like it as much as I do! In a small mixing bowl break up the tuna with a fork. Toss with the celery, onion, and parsley. Add the mayonnaise, mustard and season with pepper, to taste. Stir to combine. Add lemon juice, to taste, if using.